Oh my goodness do I love the name of this congregation – Resurrection Lutheran Church. It is a message into the messy world that we come alive, that we are reborn in God – not once, but each and every day. I’m good at negotiating the messiness of this Spirit-fueled process that calls us to become all that we are created to be (as individuals and as an organization) and calls us out into the world to share faith in Jesus Christ and this hope. Hope that doesn’t disappoint. 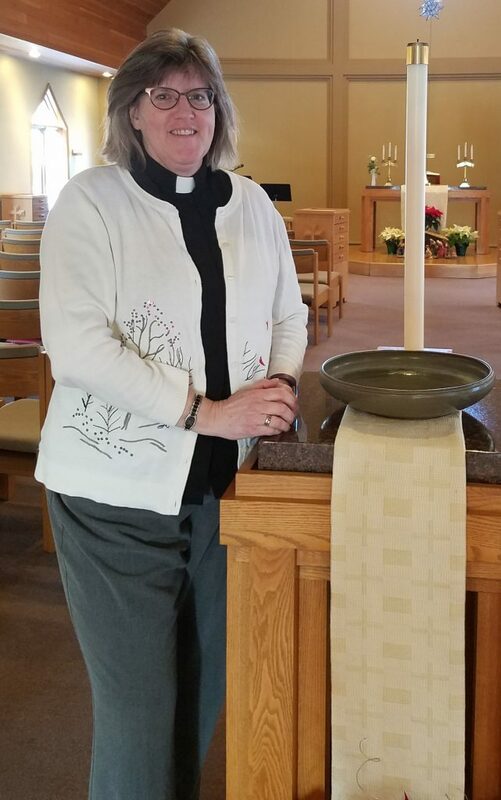 I grew up as a member of the Wisconsin Lutheran Synod. My parents moved around a lot, but I mostly call New Ulm my hometown. I was the heavy-set middle child who liked to get lost in books, but I also grew up to join the army – and became the Douglas McArthur Leadership Awardee and US Army Europe Soldier of the year. I was a Russian-language interrogator sergeant and worked in civilian clothes debriefing political refugees in Germany who were seeking political asylum. It was a strange and interesting time to be alive. I was in Berlin two weeks after the wall came down! This is the 24th time I’ve moved – and the last time for a good long time, I pray. My husband, Daryl, and I met when we were both in the army stationed in Munich Germany. We celebrated our 28th anniversary in April. He grew up in Cold Spring. He is also a Pastor and will be starting at South Santiago in rural Becker this month. We are grateful that our family keeps growing. Hannalora (our favorite daughter) and Sam live in Marshall and have 3 boys; Andreas (son #1) and Natasha live in Redwood Falls and just welcomed their new son, Warren James; Oliver (son #2) is a student at MN State University, Mankato and is following his dream to become a pilot. Caleb (son #3) is soon to be 15 and will be a sophomore at Tech High School. Life can be a little complicated and trying to explain how I went from Army Interrogator to Pastor might take a little more space than I have in this newsletter. Just know that I’ve spent time as an English-As-A-Second-Language teacher, during which time we owned a weekly newspaper in South Dakota, and there was never a part of me that thought I’d become a Pastor. That was until 2006 when the Spirit grabbed me and didn’t let go. I still like books and would like to get in better shape. After two cups of coffee in the morning I switch to decaf. One of the greatest hopes for our time together involves growing in the Word – both in better understanding scripture and seeing where the Spirit is leading us. I thank God for bringing me to Resurrection Lutheran and I look forward to spending more time with each and every one of our members. If you are thinking about becoming a member, feel free to stop by to say hello or let’s meet somewhere for a visit and a cup of coffee.